You do not have to complete the essay on this application, but please note that you are a LITI student. See Ellen to decide whether you should take the Advanced sections. You will also need to register with TC. TC registration for continuing students begins April 19th. Especially for HBSK 4072, register early to ensure your place. Check with Mary or Ellen if you have questions! The Narrowing of the U.S. Curriculum, Despite What the American People Want and American Industry Needs. Dr. Berliner is a member of the National Academy of Education, and past president of both the American Educational Research Association and the Division of Educational Psychology of the American Psychological Association. He has co-authored The Manufactured Crisis, Putting Research to Work, and the text- book Educational Psychology, now in its 6th edition. He is co- editor of the first Handbook of Educational Psychology and the books Talks to Teachers and Perspectives on Instructional Time. His newest book, with Sharon Nichols, is Collateral Damage: How High-stakes Testing Corrupts American Education. Daniela Anello, a 2009 LITI graduate, is eager to recruit for several openings at her bilingual charter school in Washington, D.C.
KIPP New Orleans schools is looking for dynamic teachers to teach across all grade levels (K-9). Check in with Meg Lally to find out more. Herndon, Virginia, near DC, is interested in hiring K-6 for their new reading/writing workshop school. TCRWP staff developers have contacted us about schools in San Francisco and Atlanta that are looking for candidates with workshop experience. Please contact us if you would like more information about any of these. We’ll continue posting! 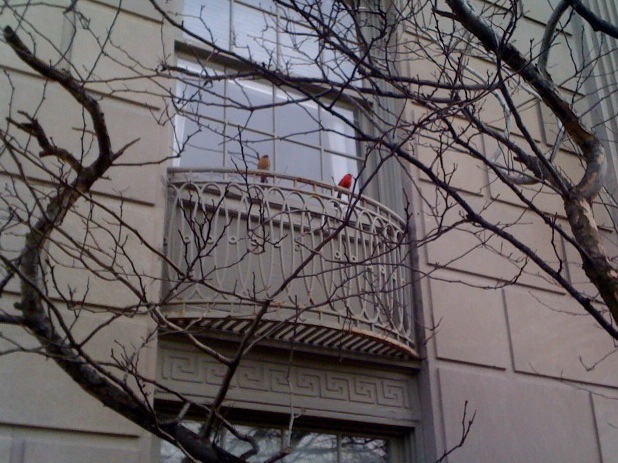 Walking along 5th Avenue, I spotted this cardinal couple shopping for real estate. They lingered while a few of us gathered on the sidewalk to watch, our heads tilted back in admiration. Finally the female bird flew off to check out another location; we passers-by sighed and smiled at each other, then hurried back to our busy days. The certification information meeting on Tuesday will be in Grace Dodge 285. Faride Suarez from the Teacher Certification Office will share procedures and answer questions. Please join us from 4-5 pm. Have a good week…spring break is almost here!